Sorry for the groan-joke title. I couldn't help myself. My blog, my yuck-yuckery, right? Anyway,this lovely fungus grew near the base of the big oak out back last year. The kids in the house behind us smashed it before I could get photos. It was more white last year but similar in shape and size. I love fungi and think this is just about the coolest thing ever. 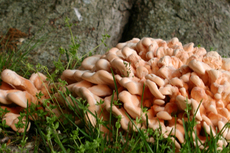 It *might* be some sort of shelf fungus, maybe Laetiporus sulphureus? I'm barely even an amateur mycologist, so I'm not sure how to narrow it down. I just call it "the brain fungus". Footnote: the kids in the house behind us smashed it again. Part of me says hey, remember when I was a kid? Mushrooms are interesting to pick apart. Part of me says they're destructive little things without any respect for nature. I hope they at least got down and really checked it out before trashing it. If/when it comes back next year (sulfur shelves are perennial), maybe I'll ask them to leave it alone. 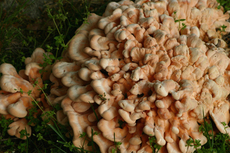 On the other hand, these fungi usually signal that the tree is in poor health (all the big oaks in our neighborhood have been dying) and the mushroom is the fruiting body of the fungus, which feeds on the inside of the tree year 'round. So maybe the kids have the right idea?